A cognitive bias is a tendency to make repeated and similar mistakes in thinking. Unlike random errors, which have no pattern, these mistakes are systematically wrong in one direction. They usually arise from simple rules-of-thumb, or heuristics, which the mind uses to help it to perform a task more easily. 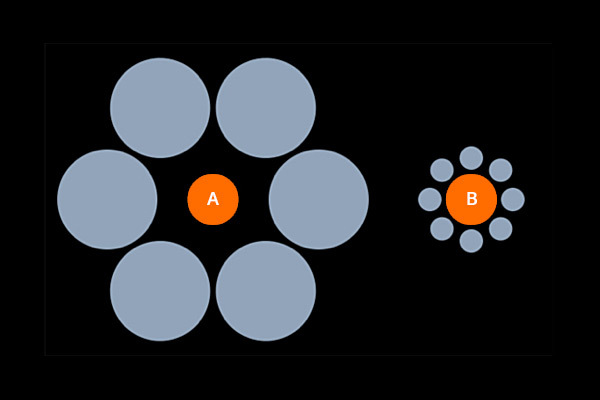 As an example, the diagram illustrates the Ebbinghaus Illusion – the orange circle on the right (B) appears, to most people, larger than the orange circle on the left (A). In fact, they are the same size. The heuristic involved here is to take the context into account, when estimating the size of things. The bias is to usually overestimate the size of objects, when smaller ones surround them – and underestimate the size of objects surrounded by larger ones. The effects of cognitive biases are not only visual. As another example, an elegant experiment was devised by Drazen Prelec and Dan Ariely at MIT in 2006 (for further details see Ariely’s book Predictably Irrational). In the experiment, people are first asked to write down the last two digits of their social security number and consider whether they would pay that number of dollars for items whose value they did not know, such as wine, chocolate and computer equipment. They were then asked to bid for these items. The result was that those with higher two-digit final social security numbers submitted bids which were between 60% and 120% higher than those with the lower social security numbers, for the same item. The heuristic here is the anchoring effect – where estimates start from an initial value which is then adjusted to give a final guess. The bias is that the adjustment is usually insufficient.